I have every achievement on original dark souls for Xbox 360 took 3 weeks while I waited to start my job. Not the whole 3 weeks. I also capped dead space 3, and bioshock infinite. Did you do it the legit way or did you farmed the way to the achivements? I dont think I’ll get the plat for this plat sadly, I can’t seem to get one ring that’s part of the “get all the rings/acc” trophy. It’s one you get from Watchdogs of Farron. I am not very good at PvP and I know I have to go and kill people who go into that swamp area for the swordgrass to get the ring. I dont know I could maybe do it but I dont know that I’d really push for it. Just letting you all know Steam Achievement Manager works for this game. been doing this offline, just need to get the Ring Achievement. Congrats! 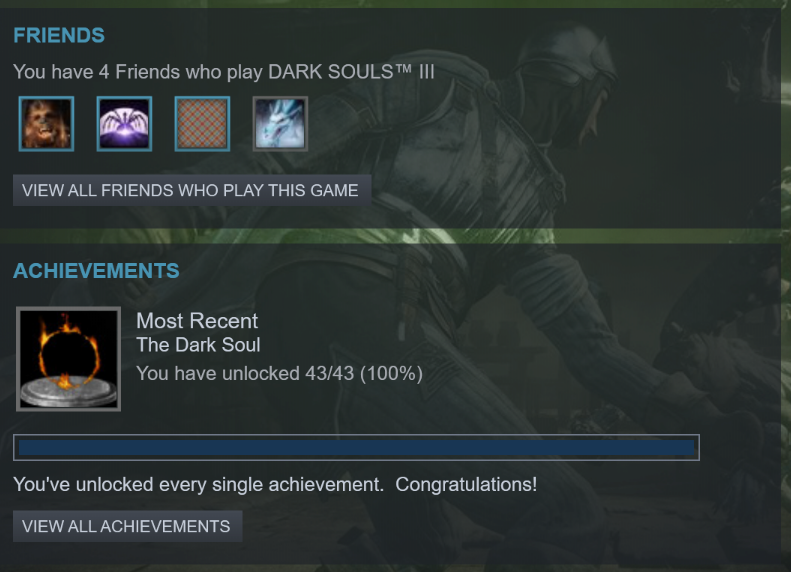 I just 100% DS1 a few days ago! Was looking into 100% DS3 next, but I heard that PvP is necessary for a few of the achievements. Is that true? How do you get four friends? Praise it? You might want to go out and look at it cause I know damn well you haven’t left the house in 45 days. Dark Souls 3 is linear and boring. nice! I remember doing this for the original Dark Souls and the sense of accomplishment you get is great. Wish I had the time to 100% more games.